Knowing the basics of accounting is crucial for accounting students. And practicing questions is probably just as important. For this reason I've created a section on this website specifically dedicated to basic accounting questions. First up is a basic multiple choice accounting test taken directly from the Accounting Basics books. This short test covers the first theory section of this site, Basic Accounting Concepts. It'll test your understanding of the accounting equation and its various elements - assets, liabilities and owner's equity. It also covers the financial position of a business. The basic accounting equation is the foundation of accounting, so you should know this well. 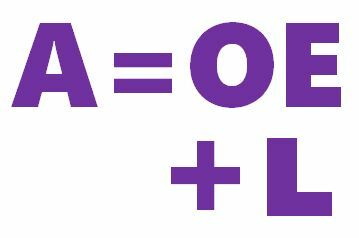 These accounting equation exercises will give you some good practice with understanding how the balances of assets, liabilities and owner's equity fit together, as well as a bit of a test of income and profit. And for even more practice, check out our page on The Basic Accounting Equation and Changes to Owners Equity Question (Fill in the Blank). Why is accounting so important? And why is it so confusing? As a student, how is accounting useful to me? What is the Journal Entry for a Cheque Received? What are the Journal Entries for a Returned Check? What is the Journal Entry for Purchasing Furniture? What is the Journal Entry for Accrued Rent? What is the Journal Entry for a Payment on Account? How do you record Interest Charged by a Creditor on an Overdue Account? What is an Outstanding Salary? What do Balance c/f & Balance b/f stand for? What is the difference between the Income Statement and the Profit and Loss Account? Note that most of these questions have accompanying solutions but some do not. Please understand that I (Michael Celender) run this site on my own, and because there are hundreds of questions that have been submitted, I have not been able to answer every single one. Because of this I have also stopped accepting new submissions. There are hundreds of questions posted all around this website. If you're looking for a question on a specific accounting topic and didn't find it above, use this site search bar. It'll help you find the question you're looking for, or at least something close. Just enter your search term below, click "search," and all pages on this site containing that term will show up. 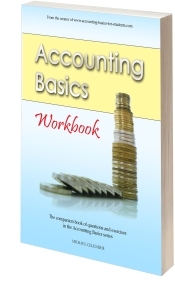 If you want to practice more questions, then you should get the Accounting Basics: Workbook. With 88 questions and exercises, this workbook will test you on all the accounting basics - from the basic accounting equation and journal entries to T-accounts, inventory and financial statements. The book also includes exercises on more advanced topics: depreciation, bad debts, provisions, closing entries, bank reconciliations, prepaid income and expenses, and more. 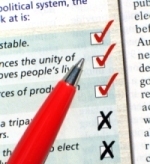 All of these questions and exercises will help you prepare very well for your tests and exams. Click here to get the book on Amazon now. Bought goods for cash $23000, how will i post it? Trial Balance Should Always Balance? Should the debit and credit totals of a trial balance always agree? If so, why ? "The best accounting system provides managers with all the information they would like to have." Do you agree with this statement? Why or why not? Q: How do you calculate the liquidity ratio? How do you account for purchases made by debit or credit card? Give an example of a liability. Bad debts in Cash Flow Statement? Debtors Control - Credit Balance? Q: Is it possible for a debtor to have a credit balance? Why Liabilities on Credit Side? Q: What do you mean by contingent liability? Q: What is the formula for Cost of goods sold in terms of sales?